One day after taking a tumble following a collision with White Sox first baseman Jose Abreu, Boston Red Sox second baseman Dustin Pedroia has landed on the DL with a left wrist injury. X-rays performed after Pedroia was removed from Monday’s game were negative, but the Red Sox still sent the four-time all-star back to Boston to undergo an MRI. The MRI revealed no structural damage, but Pedroia has enough soreness and swelling to warrant a trip to the 10-day DL. The move corresponds with the Red Sox activating third baseman Pablo Sandoval after he missed more than a month with a knee injury. Farrell said that before the team decided to place Pedroia on the DL. More recent reports indicate that Pedroia is expected to miss at least two or three weeks, although the club will seek a second opinion to help gain clarity on the severity of the injury. In any event, Pedroia figures to miss at least the first half of June but should be back before the calendar flips to July. As expected, Pedroia has been one of Boston’s most consistent and reliable offensive players this season. He’s season a noticeable uptick in his slugging percentage in recent weeks, hitting eight doubles and two home runs during the month of May after just one extra-base hit in April. Needless to say, he leaves big shoes to fill on the Red Sox roster. Boston is likely to use a combination of Deven Marrero and Josh Rutledge at second base while Pedroia is out of the lineup. Both players have helped to fill in for Sandoval at third base over the past month and will now be asked to do the same at second base. While a competent defensive player, Marrero has struggled offensively this season, hitting just .175. Rutledge has been a little better, hitting .292, but providing nothing in the power department. Marco Hernandez may have been the preferred replacement for Pedroia, but he’s out for the season after undergoing shoulder surgery earlier this month. Brock Holt would also be quite useful, as he can play just about any position, but he’s currently on the DL with vertigo and recently had his rehab stint suspended, so there’s no timetable for his return. It remains to be seen whether or not Sandoval will be the everyday third baseman upon his return. The Red Sox appeared to be in no rush to bring back Sandoval, who was just 4 for 25 at triple-A during his minor league rehab, but the injury to Pedroia forced their hand. Before his knee injury, Sandoval was hitting just .213 with an OPS of .646. Of course, the Red Sox have few other options at third base outside of Marrero and Rutledge, so they may give Sandoval regular playing time upon his return and see what he can provide. The injury to Pedroia could have ended up being a lot more serious than it turned out to be, so the Red Sox caught a break in that respect. However, the injury is yet another setback for a team that’s dealt with plenty of injuries this season and struggled to live up to expectations. 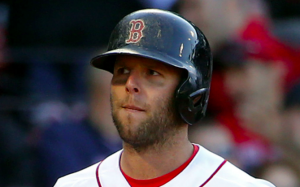 The good news is that Pedroia should return within a month, but the Red Sox may struggle to replace him while he’s out.